Full warranty and return policy...just like a new one. 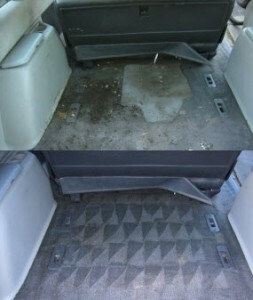 Produce cleaner interiors with the carpet extractor for auto detailers. No spots or stains remain. Use the power of hot water to break up these stubborn problems areas. Works fast. Water is hot in just 8 minutes. Lightweight. Lift in and out of your work vehicle with ease. Just 18 pounds. Small and nimble. Takes little space in your shop or work vehicle. Glides smoothly on quality caster wheels. Exceptional reach. Extra long power cord and recovery hose make it easy to reach every area of a car__s interior. Step 2: Soak stains with the included StainDetailer™ chemicals. Step 3: Spray fabric seats and carpets with your favorite carpet shampoo. Step 4: Scrub with stiff carpet brush. Step 5: Extract clean with the Hot Rod. Learn the 3 Reasons to Buy your Hot Rod from Applied Colors. Bonus 1: StainDetailer™ stain-busting chemicals. StainDetailer™ is a family of five chemicals that break down common stains like coffee, tea, asphalt, grease, red food dye, red wine, orange soda, and pet urine prior to extraction with the Hot Rod. Bonus 2: _The Car Detailers__s Guide to Stain Removal.__ In this booklet, you__ll learn tips and tricks for removing stubborn stains caused by ink, mold, chewing gum, and more, as well as extra tips on odor removal. 60 Day money-back guarantee. Buy with confidence. You can return the Hot Rod and get all your money back–plus shipping in both directions–if it doesn__t make your customers happier because their interiors look so clean thanks to the Hot Rod. Hot Rod heated carpet extractor: technical specifications. 200°F Heated solution tank. Hot water breaks down stains and dirt. (110°F water heats to 200°F in 8 minutes). Start the heater, vacuum the car, and it__s at full temp when you__re done. 1.5 Gallon solution tank capacity. Enough for 2/3 cars. 2.5 Gallon recovery tank capacity. Enough for 2/3 cars. Piston pump delivers 60psi. Strong lift to reach deep into carpets. 1600 Watt heating element. Highest rated heating element of any mobile extractor. Lights indicate when heating and when temp is reached. Know that you__re at full heat__at a glance. Power requirement less than 15 AMPs. Plug into any 110 volt outlet. 50 ft Single flow cord. Long reach for use in vans/SUVs. Weight without solution is 18lbs. Maneuverable while on the job. Easily accessible to fill, empty and clean. 102 inches of lift. Far more than your vacuum cleaner. Dimensions: 17 inches high, 18 inches long, 13 inches wide. This is the extractor that fits in your van or work truck, fits your budget, yet still produces the results of the $1500+ extractors. Case study: moldy dog food. _I detailed this minivan in 2006. Wet dog food had turned to mold, generating a nasty odor. The dog food was oily and it was tough getting to the root of the carpet. I first broke up the food with a carpet brush and vacuumed. Repeated this again. Sprayed an all purpose carpet shampoo and allowed it to dwell for 5 minutes. Scrubbed with a stiff carpet brush and extracted with a hot water extractor. Repeated this 3 times and got the results you see in the picture. The extractor was a _must have__ for challenging carpet cleanups.__ -Robert Keppel: Owner, Applied Colors. Review of the Aztec Hot Rod on TheInteriorGuy.com. This really is a professional extractor and not just some cheap wanna be. If you__re looking to add a nice professional extractor to your mobile interior repair and detailing business then I would definitely recommend you take a good look at the Aztec Hot Rod Extractor. Click the button below to add the Aztec Hot Rod Carpet Extractor (Used) to your wish list.